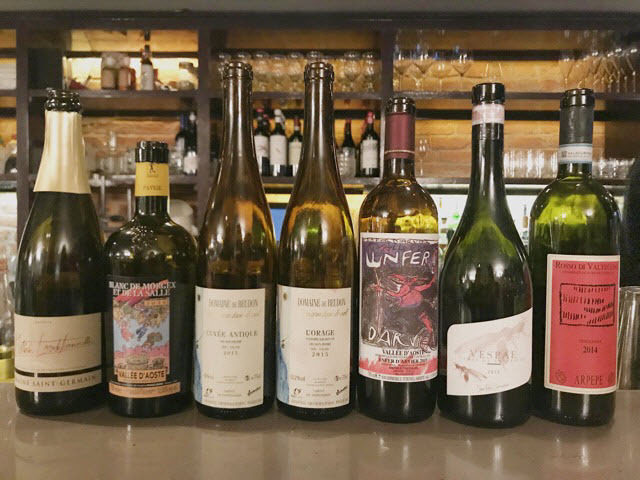 Walking into Anfora is truly a departure from the rest of West Village – sure, you might find brick walls and a cozy candle-lit feel elsewhere in the neighborhood, but Anfora welcomes you in to share an experience with wine in a way few other places do. This inviting space truly encourages guests to make themselves at home, all while indulging in some delicious wines of course. Though the menu offers glasses and bottles across the new world and old, this is THE place to tuck into some Austrian and Swiss wine if you are so inclined – the selection is really exceptional, particularly given how hard the good stuff in the region is to source, and Anfora is worth a visit just for that section alone. We decided to step into Anfora most recently for an Alpine wine tasting class (they offer a class each month highlighting a different region, and you should go to any that you can), and were treated to a comfortable atmosphere, a wonderful and carefully curated wine selection, and a wealth of knowledge from David Foss (the bartender) – the irresistibly gooey raclette didn’t hurt either. So let’s talk Alpine wine! Domaine Saint-Germain, Altesse Méthode Traditionelle n.v. This sparkling wine, made by two brothers in Savoie since 1999, is a unique find and a perfect way to cue your palate that it’s in for some delicious flavors ahead. Though Méthode Traditionelle refers to the classic method of making sparkling wine used in Champagne, the producers also favor some fascinating biodynamic techniques in their process as well. Crisp, bright and clean on the palate, the wine also has wonderful notes of toastiness and brioche that strike the perfect balance of being refreshing, complex and enticing. Like crisp, dry, high acid whites? How about some bright citrus flavors and a hint of green apple? If this sounds like your go-to, you need to track down some of this Prié Blanc from a high altitude site just outside of Morgex. Though not particularly pronounced on the nose, the flavor profile is decidedly focused, sharp, and bright, making for an easy drinking and refreshing choice that won’t fatigue your palate. This was a fascinating wine – at first glance, it looks like a white wine, but really, it’s a very light orange wine made from the Chasselas (also known as Fendant) in the Valais region of Switzerland. 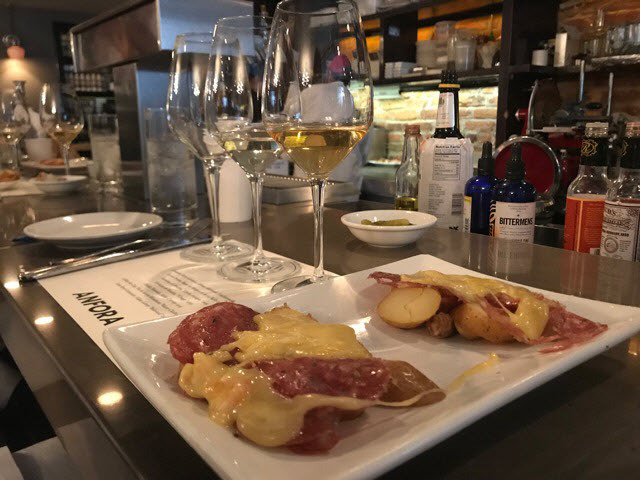 As an orange wine – made from white grapes that get some skin contact after being pressed – the wine has many of the lovely flavors of white wine, but with a touch more structure. One of our favorites of the day, the Cuvée Antique had bright, sweet aromas of orange peel and stone fruit with notes of peach, grapefruit, and wet rocks on the palate – resulting in really well balanced acidity, fruit, slight (and very pleasant) astringency, and long finish. Named for a terrible hail storm that destroyed 85% of the vineyard’s crop that year, this is truly a wine that survived against all odds. “L’Orage” is made from a blend of Pinot Noir and Gamaret, two grapes that share similar characteristics. Since you’re probably more familiar with the former, Gamaret is a grape varietal commonly found in many Alpine wines and a distant relative to Pinot Noir. We found that its inclusion added more acidity and structure, as spice and pepper notes met dark berry flavors on the palate. This ruby-colored wine was interesting and fun to enjoy – an unlikely find with a true story of adversity behind it. Don’t let the name scare you away – this ruby-colored, fruit-forward wine with a warm hint of spice is friendly as can be. The vineyards of Enfer d’Arvier, which translates to the “Hell of Arvier” in French, sit along steep slopes high up in the Valle D’Aosta (a valley populated by mountain goats at the crossroads of Italy, Switzerland and France), receiving lots of sunlight and a little extra warmth in an otherwise cooler region. Brimming with bright red-fruit flavors, particularly ripe strawberry, this wine also has a subtle kick of spice, leaving a vibrant freshness on the palate. This wine is made from 100% Mondeuse, a light-bodied grape native of the Alpine region, more specifically in Savoie. Pale in intensity, but decidedly purple in color, the Mondeuse grape lent this wine a high level of acidity and high tannins to match. This “Marie-Clothide” was youthful and earthy, with bright flavors of tart red fruit (think sour cherries, and under-ripe plum), a touch of pepper, and a hint of green tea. While Gamay is usually associated with the light, fruit-driven wines of the Beaujolais region, this one comes from the Valais, the largest wine-producing region in Switzerland. Swiss Gamay’s tend to produce richer wines than their Beaujolais counterparts, and we felt that was the case here as well. Light-bodied yet rich, this wine evoked impressions of ripe cherry layered with earthy tones of mushroom and wet leaves.